With Ultra-violet as Pantone’s Colour of the Year for 2018, warm jewel tones are the hottest look for your rooms. Here’s how – and where – to use them. 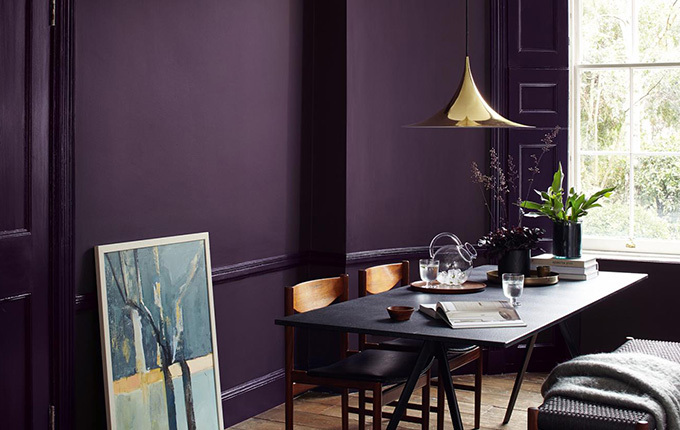 From garnet pink to deep amethyst purple, this colour palette might once have been limited to a bedroom, but now it’s crept down into living and dining rooms too, to create incredibly dramatic but warm and welcoming spaces. For a contemporary appeal for bedrooms, living and dining rooms, paint it on all four walls and woodwork, but keep the ceiling white to help bounce light around. In bedrooms in particular, colour-matching your shutters to the exact shade on your walls will create a womb-like atmosphere at night that will be incredibly cosy if lit with low level bedside table lamps. Want to combine purple and pattern – or limit the purple to accessories? Putting patterned purple wallpaper in a living room would be overpowering, so keep it to cushions and throws; in a bedroom, choose a purple patterned upholstery fabric for a headboard; for a dining room, consider purple lamp shades, which will cast a warm glow at night. Accent shades and accessories in gold and green both look fabulous with purple, but be sure to pick those colours in similar rich, jewel shades that can compete; for a more muted scheme, shop for accessories in deep blue. Purple suits woody tones, too – use dark woods for a formal space that you mainly use in the evening, or lighter and lime washed woods for a room you want to feel brighter. Ruby reds are fabulous in a dining room, can be successfully carried through to the kitchen and even look good – in splashes – in the bathroom. And, if you take a contemporary approach, it will even work in a hallway and living space. Use it on the walls in a formal dining room, but otherwise be cautious – in large proportions, this bold shade is generally best kept for rooms you only use in the evening. However, within a neutral scheme, a red rug beneath a kitchen table or under a living room coffee table; a focal red armchair or sofa in a living space; red cabinetry for a kitchen island in an otherwise plain room; a red-painted wardrobe or chest in an all-white bedroom will all create a dramatic impact. Otherwise, limit red to a vase on a table in a hallway or kitchen diner; put it on shutters in an otherwise monochromatic bedroom, kitchen or even living room; paint it on the underside of a roll top bath; or perhaps revamp wooden kitchen dining chairs with a lick of red paint. Red is a colour you don’t want to overload with accent shades – unless you’re aiming for an eclectic, laidback look. If you’re going for a modern finish, red and white will look very contemporary, while adding touches of royal blue will look elegant. Want a country feel? Combine it with green. Amber and topaz will make even the coolest east- or north-facing rooms feel warm and welcoming. Ideal for most rooms, including living spaces, kitchens, bedrooms and even bathrooms, it’s a colour palette that suits being combined with pattern – in lively upholstery fabrics, for example – or with texture, such as the slats of colour-matched shutters, rustic wall tiles or even velvety cushion covers. This colour palette works beautifully on furniture in particular, where an old-gold feel will give a room plenty of charm. If you’re putting it on walls – in paint, wallpaper or tiles – be sure to check the yellows aren’t too muddy or too zingy. Look for accessories in warm jewel tone yellows, too: a shelf of glassware in a range of shapes and tones will be eye-catching (try boot fairs and antique markets for good finds); and cushions in burnished colours slightly darker than the upholstery fabric will add depth to the scheme. Jewel tone yellows are best matched with burnished oranges, deep chocolates – but also aubergines and dramatic purples. They suit dark woods too, so consider staining floorboards or choose furniture with warm, rich grained tones. Emerald green and sapphire blue are the easiest colours to live and decorate with – and you can use them separately or together in just about any room to create a space that’s both dramatic and elegant. Deep jewel blue walls matched with white painted floorboards, ceilings and woodwork look incredibly elegant, as do deep blue-painted kitchen cabinets. As for emerald green, it’s much more suited to furniture upholstery and accessories – but, in lighter tones, can even be used on windows, in colour-matched shutters, for example. Deep jewel blues will make light-starved and north or east-facing rooms feel cooler, so be sure to add accessories and accent shades in warm colours and create pools of welcoming light with lamps; otherwise, keep it to light, bright, sunny rooms. Emerald greens, particularly the lighter part of the palette, can be much warmer, even in a gloomy room, so use these more liberally. Greens and blues work brilliantly together, with the green warming the blue up, and the blue toning down the livelier shades of the green. Otherwise, blues matched with splashes of jewel tone yellows works well, while green will suit just about any colour in the jewel-shade range.